Many, many fellows over the past few years have asked me about developing arms. As I perform my posing or strength routines, the question most often asked by an appreciative audience is, “How did you get those arms?” Even though many of my strength feats do not call for overwhelming arm development, this area of my anatomy gets the query every time. I suppose this is an American symptom, for overseas bodybuilders accuse this country of being arm-happy. Of course, foreign arm development as a whole is well below ours, so this could have a bit to do with it too. Actually, I think it goes a lot deeper than this, and the appreciation of big, powerful arms is an American folk custom. By this I mean that this country was developed by the labors of all the various pioneers and explorers over the past 300-400 years. As they pushed into the wilderness and afterwards, wresting a living from the land, these men had to work hard, work with their hands and arms and whole body, to get along. The settler, the village blacksmith, the lumberjack, the carpenter and builder . . . all needed powerful arms to ply their trade well, and in time those with the greatest, most powerful arms grew to be respected for their contributions. 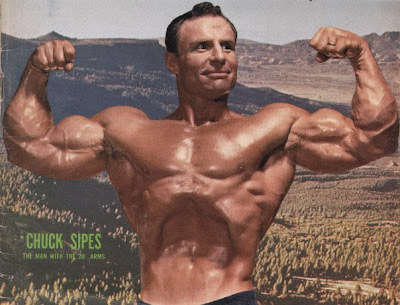 Bodybuilding today, with the glorification of the entire, well-developed physique, is still influenced by this great American heritage to the extent that big arms and powerful arms are the most respected part of the body. Sometimes this fact is lost sight of in the race for pecs, lats, delts, etc. but it is there nonetheless. The strength factor in arm training and training as a whole is lost sight of by some bodybuilders today. But without strength you cannot have maximum development. The more powerful you can become, the better developed you will also become. This is especially true in the arm area, and one of the basic tenets of my arm training. Bodybuilders are so conscious of the bigness of things. Many of them concentrate just on pumping and forget the strength part. As I’ve trained and developed power for my strength feats, I’ve found that my development of size has kept pace with strength increases. Simple, but true. If you want more size, then go for strength. But it is not as simple as “lift more weight, get bigger.” My feats involving great arm strength, such as breaking chains, bending spikes and the like, need the application of continuous arm strength over a period of time. It is this continuous application of power over a long period of time, the long holding of a contracted position, that differentiates my approach to arm training from that of other bodybuilders. And, I think my method certainly has been successful. Too many bodybuilders are used to doing a rep, resting, then doing another rep . . . they don’t have that continuous application of power in training. I design my training to take advantage of this long period of holding tension, and do many exercises that involve constant tensing of the arm muscles, especially the biceps. I’ve found that applying this strength principle to my workouts has resulted in greater power for my strength exhibitions, and greater size through working the muscle harder. Many bodybuilders say the triceps is first in arm importance, saying it is the largest muscle in the arm. I rank the triceps last on my list. Why? An unimpressive, large but droopy and poorly shaped arm is not what I want. Besides, the triceps are not as important in my strength feats. With the triceps last, next up the list with me is forearms. This muscular area of the arms is vital both to appearance - nothing is so unsightly as a big upper arm and a pair of sticks for forearms - and for gripping strength well developed forearms are essential. Every bodybuilder should work the forearms regularly as part of their workouts. I worked in sawmills and lumberjacking when I was younger, and this helped my development and strength quite a bit. But, at the top of the list is the biceps area. The better developed and stronger your biceps are, the better off you will be physically. They should be #1 on your arm training list. Therefore, this arm development article will concentrate on developing this area, the biceps. Note I said biceps area, for another important muscle vital for strength and development is located under the biceps. That is the brachialis. You should also include some work for this muscle in your biceps training, to make it as effective as possible. It will be worth your while. As I mentioned earlier, I feel continuous contractions are both beneficial and essential for power and clean-cut musculature. Because of this I design many of the biceps exercises I use to be continuous tension movements. Also, to make sure I get full muscular shape as well as power and cuts, I also do movements that are complete extensions and contractions, with a bit of rest in between the reps. For the best benefit I superset one of these full-movement exercises with a continuous tension/continuous motion movement. 1.) Cheat Curls – 5 sets of 6 to 8 reps. I make this a real power movement, starting the weight with a slight lean-back, and curling it to the top with biceps power. Once at the top, I immediately start to SLOWLY lower the weight, fighting it all the way down, making the descent last as long as possible. Once it hits the thighs I don’t relax, but swing the weight up again immediately. This way I handle the utmost in weight while keeping the motion continuous from the beginning of the set to the end, no rest for the biceps at any time. 2.) Concentration Curls – 5 sets of 10 to 12 reps. To counterbalance the cheat curls, I do concentration curls, going through a full and complete extension and contraction of the biceps. Whit my elbow braced on the thigh, I bring a moderate weight up, stopping for an instant at the peak; lower it, relax for a moment, then start the next rep, all the while concentrating on guiding the biceps through a perfect path. 3.) Alternate Dumbell Curls – 5 sets of 6 to 8 reps. I use the heaviest dumbells possible, and swing the weight a bit. Also, to add to the momentum, I swing one dumbell up, then as I’m lowering it I swing the mate up, so that both bells are going continuously from the beginning of the exercise to the end. Remember, maximum weight, swing the dumbells a bit, keep curling continuously until the end of the set. 4.) Incline Curl – 5 sets of 8 reps. To finish off my second superset, I go to incline curls, a great favorite of Steve Reeves. I do them slow and concentrated, with a moderate weight, bringing the elbow up slightly at the end of each rep. I bring one bell up as the other is going down, alternating, but go through a full correct exercise motion each rep, resting and refocusing for a moment at the bottom point of each rep. Maintain good form. 5.) Reverse Barbell Curl – 6 sets of 6 to 8 reps. This exercise, done properly and with the maximum weight you can handle, will really add power to the arm. Naturally, the overgrip limits the amount of weight you can properly handle, but you should still go for the maximum, in good clean style, and really work up the weights constantly. My final comment is against what seems to be a common practice among eager lifters and bodybuilders who want fast gains. That is, to train like a demon and then live in a state of suspended animation, doing as little as humanly possible outside of the gym. This is such a poor practice psychologically, and equally foolish when it comes to recuperation and development. You need constant circulation for best results, so light work and/or games are good. Of course rest is important, but your strength and muscle will not shrink away if you engage them in a little useful enterprise, and as I previously mentioned, working in the sawmills when I was young helped my strength immensely. Don’t worry about working or playing outside of your lifting routines as long as your barbell training keeps flowing along properly. Train hard, but remain involved in all facets of life.